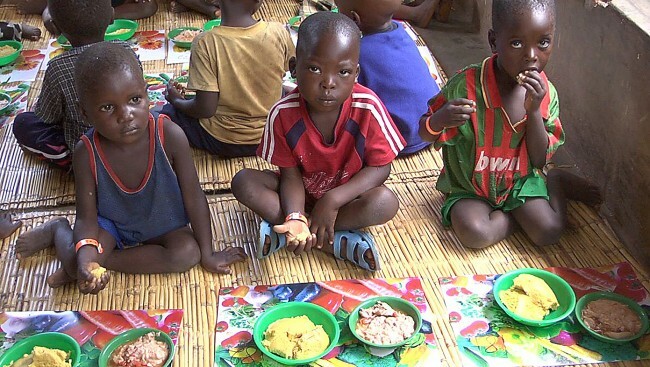 Zambian children eat a biofortified high-carotenoid maize meal as part of a feeding trial and nutritional study. (Purdue University photo/Todd Rocheford) . Later this year, the world’s population is set to reach seven billion. In the last five years alone, the world’s population has increased by an estimated 400 million people. Projections by the United Nations place the figure at more than 9.2 billion by the year 2050 before plateauing around 11 billion by 2200. This means that every year, more than 75 million people are being added to the world’s population; and almost all of this net population increase, 97% in total, is in developing countries. Increases of such magnitude are unprecedented. But the problem of population growth is not simply a problem of numbers. In fact in many ways, this growth signifies considerable achievement and is an indicator of the many positive developments that have occurred worldwide. Globally, people are living longer and more children are surviving past infancy; trends that are, in part, attributable to rapid technological advances in modern medicine and in education and awareness, particularly in the past half a century. If development entails the improvement in people’s standard of living – their incomes, health, education, and general wellbeing – and if it also encompasses their self-esteem, respect, dignity, and freedom to choose, then the important question about population growth is this: How does the contemporary population situation in many developing countries, including Zambia, contribute to or detract from their chances of realizing the goals of development, not only for the current generation but also for future generations? This is a question being raised, the world over, as countries look at finite areas of land and natural resources which must now stretch to accommodate the demands of many millions more. Secondly, to what extent does rapid population increase make it more difficult to provide essential social services, including housing, transport, sanitation, and security? While the rate of population growth and population density are key factors that impact the level of well-being, it cannot be taken in isolation and is often not the primary cause of low standards of living, gross inequalities, or the limited freedom of choice that characterize states of under-development. The fundamental causes of persistent poverty, unemployment and inequality often lie in poor policy and investment choices with the benefit of development not directed to the underprivileged. An equitable social and economic development agenda that ensures higher standards of education, nutrition, family planning and health for all, and a low carbon growth strategy that ensures a balanced management of natural resources and the carrying capacity of the land we live on, become essential to managing a high Human Development trajectory alongside the given population trends. The population in Zambia has jumped from under 8 million to over 13 million in the past 20 years and 3 million children have been born in the last decade alone. The annual population growth rate of 2.8%; with 46% of the population under the age of 15 years and a dependency ratio as high as 1: 0.9, are issues of growing concern. The population in Zambia is projected to double in the next thirty years. The country must concentrate on addressing the underlying social and economic conditions related to population issues to ensure that the rate of human development keeps up with population growth. First, ensuring the right of girls and women to education–education plays an important role in enabling girls and women to secure other rights enshrined in the Universal Declaration of Human Rights. The main reason for this is the fact that poverty results from violations of human rights, including the right to education, which disproportionately affect girls and women. Various grounds of discrimination combine, trapping girls and women in a vicious downward circle of denied rights. Denial of the right to education leads to exclusion from the labour market and marginalisation into the informal sector or unpaid work. This perpetuates and increases women’s poverty, literary subjecting half of the society to poverty. According to the institute for Women’s Policy Research, graduating from high school alone increases working mothers’ earnings by over $1.60 per hour (over $3,300 per year). In contrast, each year of work experience is worth only 10 cents per hour. Second, contraceptive use, family planning saves lives and has long been considered a key aspect to socioeconomic development. By one estimate, satisfying the unmet need for contraceptive services in developing countries would avert 52 million unintended pregnancies a year, thereby saving 1.5 million lives and preventing 505,000 children from losing their mothers. In Zambia, contraceptive prevalence rate increased to about 33% nationally, with great variance between provinces, from a low of 14% in Luapula Province to highs of 37% and 40% in Copperbelt and Lusaka Provinces, respectively. This is still very low per global averages, although the trend is positive. Unmet need for family planning is 27% which is also relatively low even by SADCC standards. World-wide 1,000 women die every day from complications of pregnancy and childbirth. These deaths can be prevented. When women and couples are provided with adequate reproductive health information and services, including family planning, we can ensure that every child is wanted and every birth is safe. And we can reduce poverty. Third, improved coverage and quality of health, water and sanitation services for those who lack them would do much to reduce the burden of water-related diseases and to improve quality of life. Studies have consistently shown that improvements in water and sanitation coverage – including the implementation of low-cost, simple technology systems – can reduce the incidence of diarrhoea, cholera and other water-related diseases. Furthermore, providing water and sanitation confers multiple benefits beyond reducing water-related diseases, including alleviating the time and economic burden of having to collect water contributing to human dignity particularly of women. Finally, the more sustainable use of a country’s natural endowments-of land, energy and water is an essential part of the equation. Moving towards a more sustainable growth path, that is low carbon and climate resilient, will enable Zambia to carry a growing population with production and consumption patterns that ensure a balanced approach to conserving its natural resource base while meeting the demands of people, so it remains a rich heritage also for future generations. Having said this, let us close on noting the numbers and aspirations of a Young Zambia – today, with almost half the population of Zambia under the age of fifteen, investing in young people so they have an opportunity to realize their potential, is what will drive long term wealth creation in the country. When young people enjoy good health, including sexual and reproductive health, higher education and decent working conditions, they are a powerful force for economic and social transformation. Investing in young people is one of the smartest investments a country can make. A central premise of the work of the United Nations is that the size, growth, age structure and rural-urban distribution of a country’s population have a critical impact on its development prospects and on the living standards of the poor. Investing in people — and empowering individual women and men with education, equal opportunities and the means to determine the number, timing and spacing of their children — create the conditions to break out of the poverty trap and increase levels of human development. As we approach a world population of 7 billion, each one of us is an equal part of the efforts to rid the world of poverty. Our small individual actions, multiplied across the world, can lead to a positive change for everyone and every community. A population of 13 million is sustainable but whether Zambia can become an equitable prosperous middle human development country by 2030 is dependent on the decisions and choices that Zambia now makes with regards its growing young population.